in response to the lack of consideration and care for plants and trees, soil, water, and animals, waiting for humanity is an attempt to induce humankind to consider and assume responsibility of stewardship, revitalization and care for our sacred Earth, before all else. If we – humans/animals – do not care for the Earth first, our civic issues have no bearing, for this is where we exist. Privilege, currency, freedoms, and rights have no matter if our Earth is suffocated by consumerism and capitalist values. waiting for humanity is one section of a larger work currently in progress with Ana Lopes Aréchiga. First Up! Hymn of the Crescent on September 7 & 8 for the 30th anniversary Friends of Dance Concert at the University of New Mexico. Kerry Ring and I have teamed up via internet correspondence to realize a new solo, originally inspired by Kerry’s 1997 solo performance at UNM. 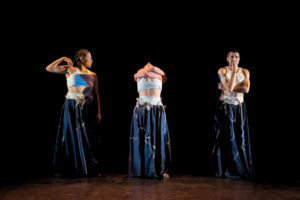 Informed by poet Nikki Giovanni’s Ego-Tripping (1973), Kerry and I have collaboratively created a choreography rich with feminine power and striking imagery that tells the story of how this divine Earth was made, and more importantly, how we must care for her. Kerry and I will formally meet for the first time the day before opening nite! 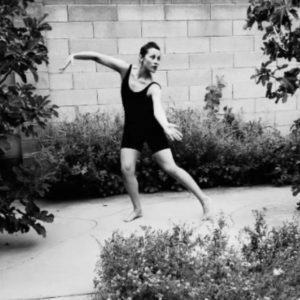 SHIFT | DANCE will also perform at the Friends of Dance concert September 7 & 8 and at TEDX ABQ, September 29!! 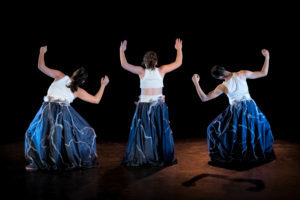 The trio revisits excerpts from their 2017 multi-media work, EKO-kinesis. SHIFT drew inspiration from Pastel’s murals in Downtown Albuquerque as the primary launching off point for EKO-kinesis. We investigated the layout of Pastel’s subject matter, the textures of the paint, design of the lines, and saturation of color as entry points to inform our movement choices. 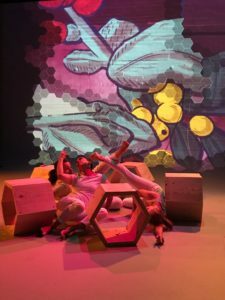 What emerges on stage is a direct result of the “cross pollination” of artistic ideas, styles, and mediums unfolding in real time and interpreted through our moving bodies. EKO-kinesis was commissioned in 2017 by 516 ARTS in conjunction with their Cross Pollination exhibition and in collaboration with the UNM ARTS LAB design team. And coming up! 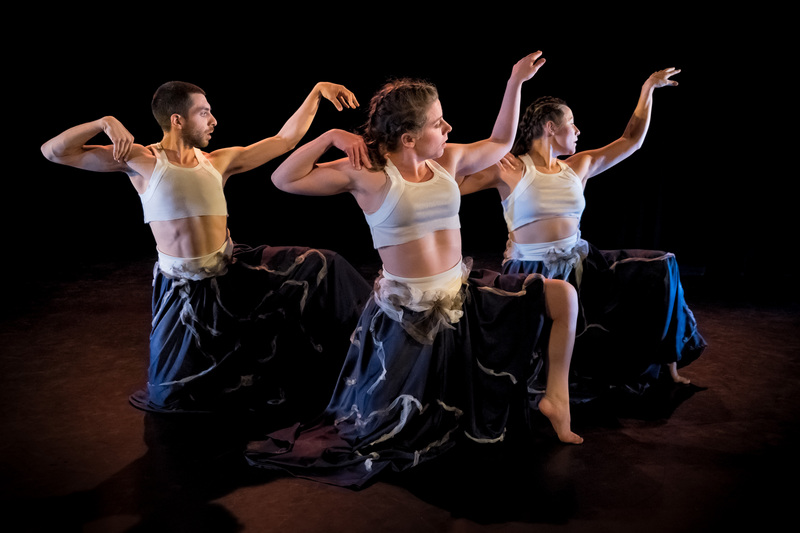 SHIFT DANCE | FESTIVAL 2018, September 24-29! 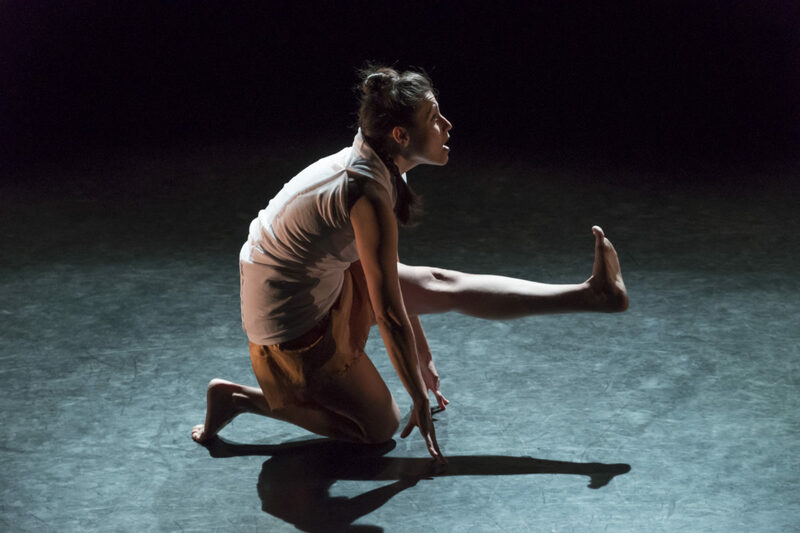 This year’s festival features works from ARCOS Dance (Austin, TX), Rebecca Lemme/Acts of Matter (Los Angeles, CA), and a newly commissioned work for SHIFT by Jessica Miller Tomlinson (Chicago, IL). I will also share initial movement research for my new solo tone, on Thursday September 27 at 8 pm at the North Fourth Art Center. 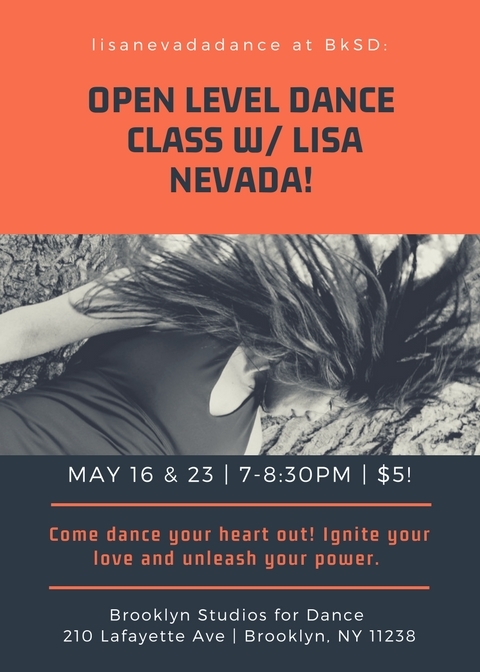 Join lisa nevada for an open level class series that will ignite your love for moving and inspire untethered expression. Participants will be guided through a full body warm-up then transition into boundless movement exploration, individually and as a community. Each session will conclude with 10 minutes of stretching and breath work to restore our energy and heal our bodies. Each session will provide a safe environment, free of judgement and full of love. ALL are welcome. 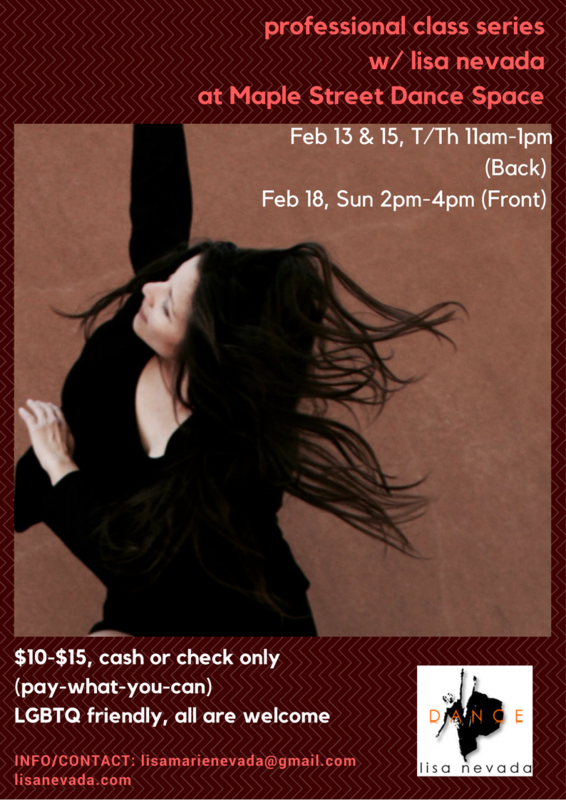 Come dance your heart out! 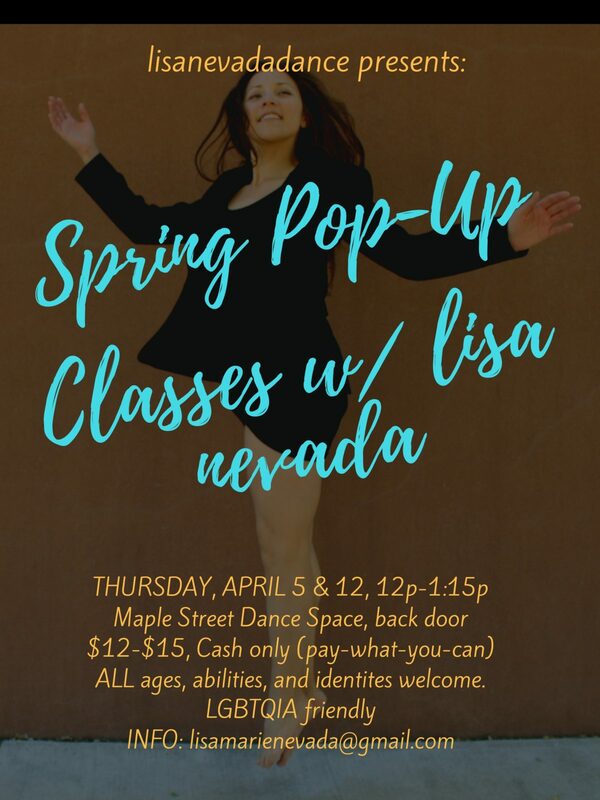 Join lisa nevada for a series of dance classes geared toward the professional dance artist and those who are ready and willing. Each class will provide a simple, yet rigorous warm-up that will serve as the groundwork for boundless movement exploration. We’ll expand into a generous movement vocabulary, and mine phrases through repetition and duration. Each session will provide a safe environment, free of judgement, full of love. LGBTQ friendly, all are welcome. Join lisa nevada for an open level class series that will ignite your love for moving and inspire untethered expression. Participants will be guided through a full body warm-up then transition into boundless movement exploration, individually and as a community. Each session will provide a safe environment, free of judgement and full of love. 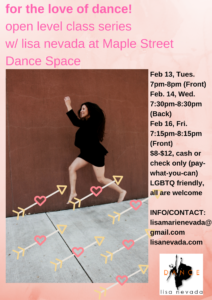 LGBTQ friendly, all are welcome.